A quick reminder for all residents and home owners. If you own a home in Franconia that has a monitored fire alarm system you are strongly encouraged to purchase a Knox box key holder. This is even more important if your home is a secondary residence. A Knox box is a secured key box that is mounted to your home which only the fire department has access to in an emergency. Winter Brings many challenges. Be prepared, have your chimney inspected by a professional. Be careful with space heaters. Never leave a motor running in a garage: car, generator, etc. 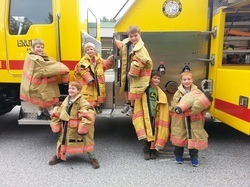 Be safe...this could be the crew that shows up to save the day! 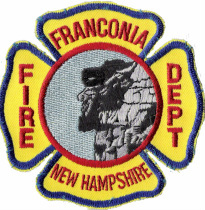 The Town of Franconia has certain requirements in order to burn materials. Most of the requirements are regulated by state law. NH law prohibits backyard trash burning. 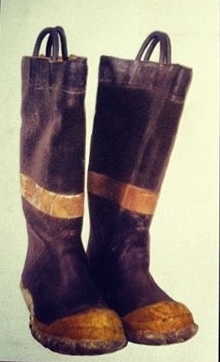 It takes a special person to fill the boots of a volunteer firefighter. Someone with a desire to do something important for the community. Someone with courage and dedication, who isn't afraid of hard work, and is willing to accept the challenge of a difficult job. It takes a person who considers respect and appreciation reward enough, and who is just glad to help. If you're this kind of person, you're needed as a volunteer fire fighter. Come down to the fire station and talk to us. We might be able to fit you with a pair of boots! When the fire alarm sounds, everyone should get out and stay out. If fire extinguishers are available to fight small fires, know where the closest extinguisher is located. you have a clear escape route in case you can't put out the fire. you know what's burning and you extinguisher is right for the job. It is dangerous to use water or a class A extinguisher on a fire involving flammable liquids or energized electrical equipment. Class K extinguishers are used for fighting fires in commercial kitchens where combustible cooking oil is used. The dry chemical discharged from multipurpose extinguishers is corrosive. It can damage electronic components if it is not cleaned up immediately. To use your extinguisher, remember "P.A.S.S." Pull the pin that unlocks the lever. Squeeze the lever above the handle to discharge the agent. Sweep the nozzle from side to side. Move carefully toward the flames, keep the nozzle aimed at the base of the fire, sweep back and forth. Test Smoke Alarms regularly, replace batteries twice a year. Make sure all family members know what to do in the event of a fire. Draw a floor plan with at least two ways of escaping every room. Make a drawing for each floor. Make sure the plan shows important details: stairs, hallways and windows that can be used as fire escape routes. Test windows and doors—do they open easy enough? Are they wide enough? Or tall enough? Choose a safe meeting place outside the house.Practice alerting other members.